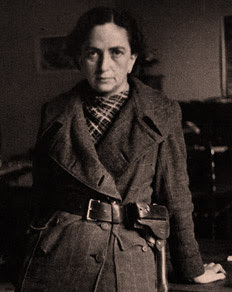 It has been 16 years since the death Micaela Feldman de Etchebéhère , an Argentinian woman who commanded a column of POUM militia in the Spanish Civil War. A friend of Julio Cortazar, Alfonsina Storni, Andre Breton and Copi, her extraordinary history is little known. She not only fought in this war but also lived through all the ideological adventures of the 20th Century. 1931 saw them in Europe, first to Spain,, 1932 in Germany where they witnessed the rise of Nazism, then in 1933 to Paris where they were involved with the revolutionary group, Que Faire. Three years later they were back in Spain where they joined a POUM motorized column. Hipólito was given command. One month later he was killed at Atienza. Because of the machismo, at first Mika had difficulties being taken seriously. The militia men protested that In other companies the women wash and mend the men’s socks. Mika replied The women who are with us are militia members. We fight together, men and women, equal, and nobody better forget it! And we are all volunteers! Little by little, she overcame her lack of knowledge of military strategy and assumed the commanding role in the column. She crawled through the trenches on her hands and knees through the mud, gathering arms, keeping the revolutionary spirit alive among the militia as she fought beside them. She was then made Capitan and fought on the fronts of Sigüenza, Moncloa, Pineda de Húmera. With the defeat by the fascists she fled to France, but returned to Argentina before she could be arrested by Vichy. Mika returned to France in 1946. In Paris in 1968, Mika was seen getting students to wear gloves as they dug up paving stones to throw at the cops, since their hands would be clean and there would be no evidence if they were arrested. The policeman who later escorted her to her house had no idea that the handbag of this 66 year old, elegantly dressed lady was stuffed full of dirty gloves. thoughts of every world-wide-web marketer. especially a person that is very competitive.